The Public Procurement Commission (PPC) is investigating an alleged attempt to tamper with a bid document at the National Procurement and Tender Administration Board (NPTAB). The Commission, which is the body to investigate wrongdoings in the handling of state contracts, has written the NPTAB asking it also to explain why they were not apprised earlier that there was a problem. The attempt to tamper with a bid document has raised alarming questions for NPTAB, a processing entity for state contracts. It acts as a sort of clearing house for accepting bids from ministries and state agencies, processing and recording them. Over time, the NPTAB has been accused of wrongdoings, including collusion with contractors. 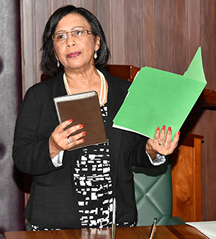 Yesterday, Minister within the Ministry of Finance, Jaipaul Sharma, in giving an update said that Procurement Commission wrote asking for a report. “I can tell you that matter is being looked at by the Procurement Commission. They have asked for a report into the alleged incident,” Minister Sharma said. However, while Sharma was tightlipped, Kaieteur News was told that the Procurement Commission was upset that it had to learn of a problem at NPTAB through the media. On Tuesday, two Procurement Commission officials were present at the Tender Board proceedings at the offices located in the Ministry of Finance compound, Main Street. Until now, the NPTAB has not issued an official statement. In fact, it was only when approached that Finance Minister, Winston Jordan, disclosed that a report has been completed with the matter being addressed by the Finance Secretary, Michael Joseph. Jordan admitted that “some irregular activities” occurred. Asked about whether he is worried about the breaches after the Coalition Government had vowed to clean up things at the Tender Board, on being voted in May 2015, Jordan was clear. He said that there is evidence that some “irregular activities” happened at “irregular times”. There is no clarity up to now if the matter has been handed over to the police as has been reported earlier. According to Minister Jordan, while he is not sure whether the police are actually dealing with the matter as was reported by Kaieteur News, ultimately that may be the direction. 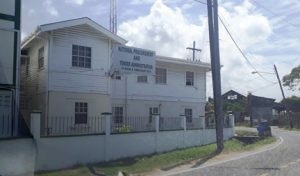 It was reported that a Senior Procurement Officer of NPTAB, who has been there for years, was sent on administrative leave almost three weeks ago. This was after he was reportedly caught on camera taking bid documents from a secured room at NPTAB. It was reported that NPTAB, which oversees the opening of bid documents from contractors and suppliers, processed a number of them. The documents were then stored in a special room. Copies were reportedly also in the custody of a senior manager. Hours later, the staffer asked permission to enter the room, something that is unusual. Rather, under the control system, the officer should have requested documents and sign for them. He reportedly stashed the documents in his pockets and later left the NPTAB compound without returning it. According to officials, an internal probe found that two tender documents were raised by $15M. However, the attempt to tamper was discovered after a staffer talked and checks revealed that a copy of the bid document in the custody of the senior manager did not have the new figures. The contract, a road project, was said to worth over $100M. Sources have been raising serious questions about operations at the Tender Board. While reporters and representatives of the contractors, ministries and state agencies are present when bids are opened, that is not where the wrongdoings are happening. According to sources, there are a number of other persons. “There are figures being changed. Everybody from ministry officials to Tender Board officials know what is happening behind the scenes. It involves millions of tax dollars. You want to know how bad it is, check where they live and what they drive,” one source explained. It was said that last year, the same staffer was caught on tape asking a contractor for money, but the matter went dead.